Since 1990, when Robert Jordan's The Wheel of Time(R) burst on the world with its first book, "The Eye of the World, " readers have been anticipating the final scenes of this extraordinary saga, which has sold over forty million copies in over thirty languages. When Robert Jordan died in 2007, all feared that these concluding scenes would never be written. 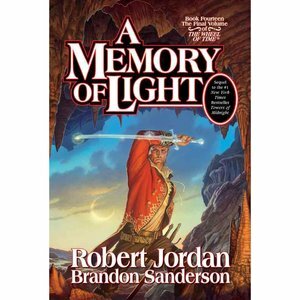 But working from notes and partials left by Jordan, established fantasy writer Brandon Sanderson stepped in to complete the masterwork. With "The Gathering Storm" (Book 12) and "Towers of Midnight" (Book 13) behind him, both of which were # 1 "New York Times" hardcover bestsellers, Sanderson now re-creates the vision that Robert Jordan left behind. Edited by Jordan's widow, who edited all of Jordan's books, "A Memory of Light" will delight, enthrall, and deeply satisfy all of Jordan's legions of readers. "Let the Dragon ride again on the winds of time."